[SEPT. 11, 2006] The cooler nights sure make for better sleeping weather, but they are also a sure sign that fall is on the way. With the cool weather, we have quite a few insects that are looking for a warm place to be. Insects look to "sun" themselves on a south or west-facing wall to catch warmth in the afternoon. That brings us to nuisance pests. A nuisance pest is anything that causes us grief. Ones that I would target as nuisance pests right now include Asian lady beetles, ants, crickets, boxelder bugs, elm leaf beetles, and woolly bear caterpillars. All these things are in and around the house and generally making things miserable for us. With nuisance pests, the best offense becomes a good defense. We can start with a barrier pesticide application on the foundation of the house (and the adjacent foot or two of soil around it) with something like permethrin insecticide. This puts down a barrier that insects crawl through when trying to get in or on your house. Insects may not die immediately but shouldn't last long after crawling through this barrier. In severe cases of insects congregating on outside walls, entire walls can be treated. Just make sure you test apply the chemical to a small section to make sure you don't discolor siding. Of course, if insects are already in the house, the barrier won't stop them. Inside the home, only aerosol products should be used. The safest of the group are the ones that are for flying insects and contain pyrethrins or their derivatives. These products basically kill insects that you get the spray on, and the sprays are inactivated by hitting the wall, floor or other surfaces. You can spray the air in a particular room and vacuum up the dead insects in an hour or so. This is one way to get insects inside the house. Remember the toxic principles of pyrethrins and pyrethroids on dogs and cats, particularly with direct sprays. Another useful tactic, particularly with ants and crickets, is to use baseboard-type sprays. These products are typically labeled as ant and roach products and may last for several weeks. Just spray in the high insect traffic areas, along baseboards, to put down a lasting barrier inside the house. For ants, the bait stations also offer us the opportunity to kill the entire nests. The bait stations are probably the most effective, but they should be used alone for at least a week. Then you can also use the baseboard sprays. The idea is to let live ants get to the bait and take some to the nest. For those who don't like to use chemical products, the use of sticky boards (like the type used for rats and mice) offer an option. 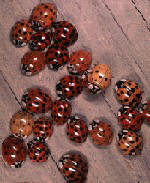 Place these in areas where many insects are seen, such as room corners and under stairs in the basement. The vacuum cleaner is also a good option for cleaning insects from draperies and the like. Time to finish up and check! Finish up any seeding you wish to do this fall. Waiting later, especially with bluegrass, will hurt your chances of getting seed started this fall. Also, check for grub numbers now, especially with the moisture we have had since August. You can cut a small square of lawn and check for the number of grubs in an area. It generally takes eight to 10 grubs per square foot to cause substantial damage to turf. Springtime treatments are generally not effective.